In general, most adults talk about politics with people of varying political views, some of which are in line with their own views and others which run counter. But, as these data reveal, discussing politics with people of varying viewpoints becomes less frequent among those with strong ideological ties. To begin with, those with stronger ideological ties are more drawn to political discussions in the first place. The vast majority (81%) of those with consistently conservative political values enjoy talking about politics, as do 69% of those with consistently liberal political values. That compares with just 44% of those with more mixed political views. This greater enjoyment translates to more frequent discussions. 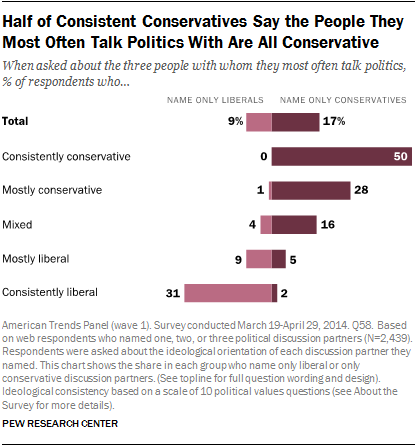 Roughly seven-in-ten consistent conservatives (68%) and six-in-ten consistent liberals (57%) talk about politics at least a few times a week – about twice that of those with mixed views (31%). Just a quarter of respondents with mixed ideological views say that most of their close friends share their views about government and politics. More (44%) say they have many friends who do not share their views. Three-in-ten (30%) say they don’t really know what most of their close friends think about government and politics. Those whose political views are solidly on the left or right – and especially those on the right – have a much greater tendency than others to have politically like-minded friends. 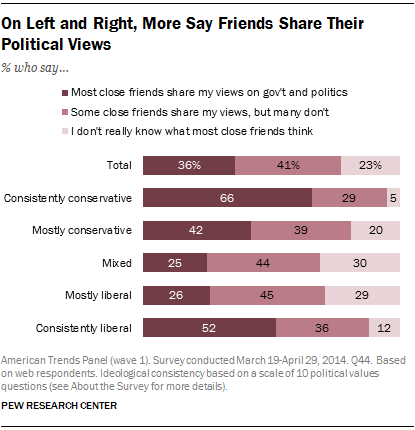 Two-thirds (66%) of consistent conservatives say most of their friends share their political views, more than twice the number who say only some of their friends do (29%). A mere 5% don’t know the political views of their close friends. Consistent liberals are somewhat less likely than consistent conservatives to have politically like-minded friends. About half (52%) say most of their friends share their views – though that is still twice that of those in the middle. And 12% are not aware of their close friends’ political views. Similar to what the data reveal about people’s circle of friends on Facebook, consistent liberals might have close friends that span a wider mix of political views than consistent conservatives, but they are the most likely to stop talking to or being friends with someone because of politics. 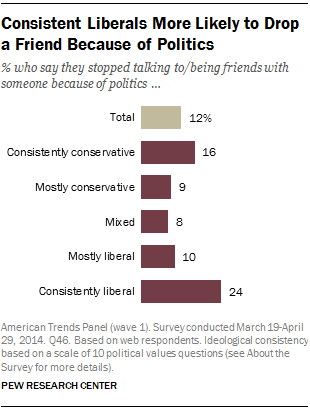 Though only about one-in-ten respondents (12%) say they have stopped talking to or being friends with someone because of politics, about a quarter (24%) of consistent liberals have done this. This compares with 16% of consistent conservatives and 10% or less among those who are less ideologically consistent. To gain a more granular understanding about politics in people’s everyday lives, panelists who at least occasionally talk about politics were asked to list up to three people with whom they most frequently discuss the topic. People likely talk about politics to more than the three individuals they were asked about here. Indeed, 70% of respondents who name at least one person say there are others they talk to as well. Nevertheless, a look at the three people that panelists name again shows the greater tendency among those with strong ideological alignments to affiliate with like-minded people. And again, these data suggest that this tendency is stronger among those with conservative political views. Half (50%) of consistent conservatives, along with 28% of those with mostly conservative political values only name individuals they describe as also conservative. 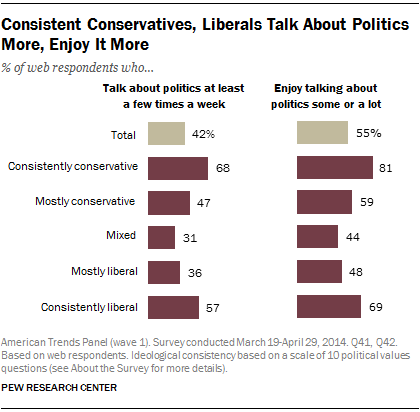 Consistent liberals are on par with those who hold mostly conservative views. 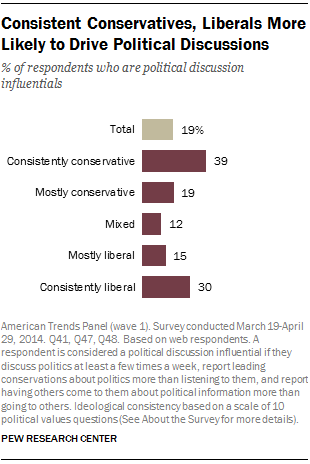 About three-in-ten (31%) consistent liberals name only fellow liberals. That was the case for just one-in-ten (9%) of those with mostly liberal views. 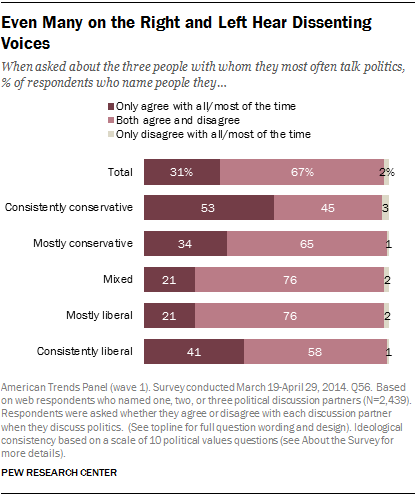 It is worth noting, though, that for about half of consistent conservatives and the clear majority of consistent liberals, the three people they most often talk to about politics include people who do not share their ideological views. 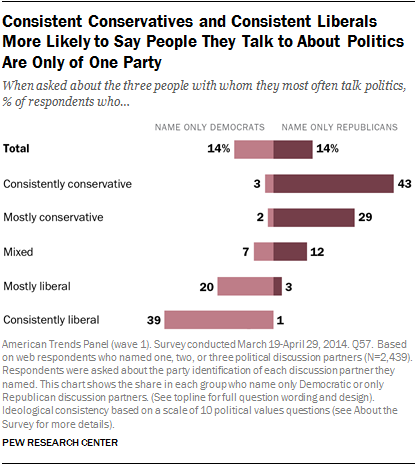 Respondents were also asked about the political party affiliation of each of their discussion partners. On this measure, 39% of consistent liberals only name Democrats, while 43% of consistent conservatives only name Republicans. The slightly different pattern in the discussion partners by perceived ideology and perceived partisanship may, to some extent, reflect that more of the public self-identifies as conservative, rather than liberal, but at the same time more of the public identifies with the Democratic Party rather than the Republican Party. In political conversations, most people encounter some disagreement; even with those they consider their closest discussion mates. But that experience is less common for those at either end of the ideological spectrum. Overall, about two-thirds of panelists who talk about politics (69%) name at least one discussion partner with whom they disagree with at least some of the time, while 31% only name individuals with whom they agree with all or most of the time. Among those with mixed and mostly liberal political views, there is even more exposure to differing views: nearly eight-in-ten (79%) disagree at least sometimes with at least one of their closest discussion partners, and just two-in-ten (21%) only name people with whom they agree. At the political edges, though, and particularly on the right, there is less disagreement and greater reinforcement of one’s political views. About half, 53%, of consistent conservatives who talk about politics agree all or most of the time with all of their top discussion partners – more than double that of those with mixed political views. The same is true of 41% of consistent liberals. Along with discussing politics to a greater degree, the more ideologically consistent also tend guide political discussions. And here, liberals and conservatives take the lead at roughly the same rate. 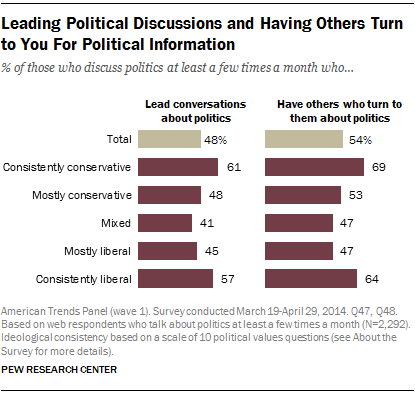 The Pew Research Center asked panelists who talk about politics at least a few times a month whether they tend to lead or listen to these conversations, and if people tend to turn to them for information about politics. Overall, those who discuss politics at least a few times a month are fairly evenly split on both measures. But majorities of both consistent conservatives and consistent liberals describe themselves as leaders (61% and 57%, respectively) and as having others turn to them for information about politics (69% and 64%, respectively). Those who frequently talk about politics, lead political conversations and have others come to them for political information can be said to be at the forefront of political discourse. In other words, they are political discussion influentials. 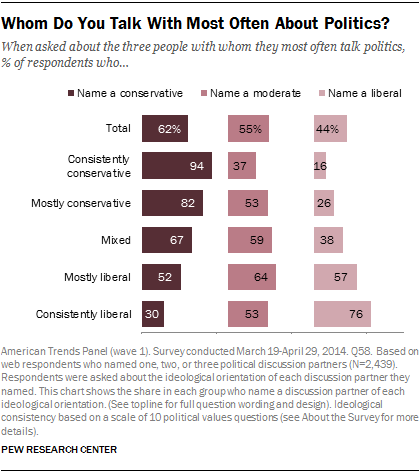 Again, the data reveal the heavier role played by those with stronger ideological leanings. Just a small minority (19%) of respondents overall fall into this category, but this number rises to nearly four-in-ten (39%) consistent conservatives and about three-in-ten (29%) consistent liberals. Again, mostly conservatives, mostly liberals and the mixed lag behind.